“A Legend of the Pottawatomi” is an origin story that explains the start of the Pottawatomi Indian Race. Origin stories are also known as “narratives”, “creation stories” or myths”. 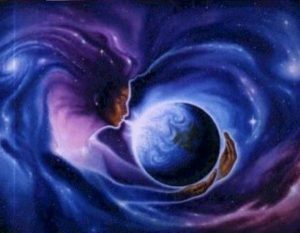 However it is important to note that “creation stories” are focused on the start and “early development of the entire world or earth”, while origin stories, similar to “A Legend of the Pottawatomi”, focus on the “human origins or founding of ‘the people’ i.e. a given tribe or nation”. In particular, through this origin story, Kitchemanito, or the Great Spirit, recreates the “wicked dogs” of the earth with a flood by replacing them with a man and sister. Then, through a dream, the sister is required to pick the fifth suitor, who represents Maize in order to start the Pottawatomi tribe. This origin story also focuses on a particular phenomena such as the ocean/lake that is multiplied in many other American Indian origin stories. Lastly, this “A Legend of the Pottawatomi” is close to an “emergence” type origin story because when the Great Spirit “withdrew the earth and made a handsome young man” the man came from a “primordial form and ‘emerge[d]’ on land”. 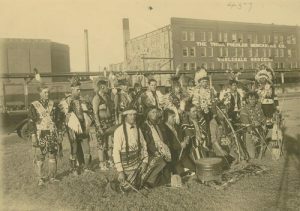 From the union of the sister and the maize, the Pottawatomi tribe is born as well as their various crops, traditional religious ceremonies and feasts. As a Tribal Educator, Elmira seeks to explain her culture to the white audience who reads The Indian Craftsman and to preserve her culture within “A Legend of the Pottawatomi” about the Pottawatomi Native American tribe. Through the creation story, Elmira shows that the Great Spirit created a new creation, the Pottawatomi Indians, who contrast with the old creation, the “wicked dogs”, in the sense that they are more civilized. At the start of the legend, the Great Spirit uses a metaphor when he considers the original people on the earth to be “perverse, ungrateful wicked dogs”. This relates to the idea that the Native Americans were uncivilized and considered savages before they entered the school. The school was created by Henry Pratt is order to civilize these Native Americans through assimilation tactics. However, this legend indicates that this savagery only existed at the beginning of the native culture. The story does not end with the vivid imagery of “wicked dogs” being “plunged” into the sea. Instead, civilization is born through the creation of a new man by the Great Spirit. This new man is set apart because he chose to obey the Great Spirit rather than to refuse to submit to him like the “wicked dogs” had done previously. After having a dream that the Great Spirit had sent him, the man relayed the meaning of the dream to his sister, whom the Great Spirit had created in order to comfort the Man. 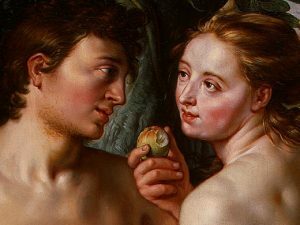 Similarly, the sister chose to obey the man and, indirectly the Great Spirit by following the foreshadowing/prophecy that her brother had revealed to her and picking the correct suitor. She thus, chose Mondamin as her suitor and began the Indian Race. 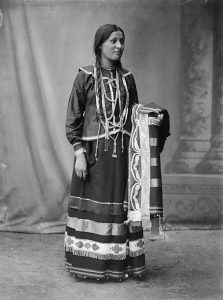 From this choice, the sister was blessed with crops from the Great Spirit in order to have feasts and ceremonies, in result displaying key elements (structure and traditions) of a civilized people. These ceremonies and crops seemed quite important to the Pottawatomi Indians because they believed they were blessed by the Great Spirit in order to have these traditions and values. In return, they also desired to give back to the Great Spirit. This story also explores the matriarchal features of the tribe. 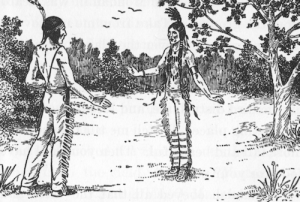 A clear example of this is the fact that the man was “very sad and lonely”, so the Great Spirit created a sister in order to “cheer and comfort him”. 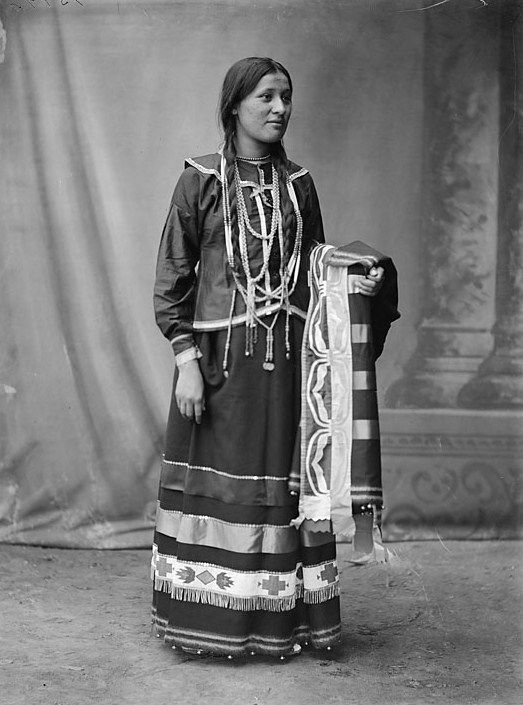 Later this sister, after being instructed by the Great Spirit through the man’s dream, had to choose the fifth suitor. Usually if this was a patriarchal society, the man would be the one to find a wife in order to start the Indian Race, however a sister, or female, was chosen to start the Indian Race with the fifth suitor, Maize, who symbolizes corn. “Mondamin, maize” is quite an important character, since he is the only suitor of five who has alliteration in his name. This legend, in a way, empowers women because the sister had the responsibility of choosing the correct suitor and beginning the Indian race. This connects to the cultural context of the tribe because women were as equally important to gathering food for the tribe as men were. They were not submissive or on a lower level compared to men. There are interesting connections between the Pottawatomi creation story and the Christian creation story. In both of these stories a flood over the entire earth is involved. At the beginning of the Pottawatomi legend, the Great Spirit “plunged the people” into the great lake because they were “wicked dogs and did not raise “their eyes in Thanksgiving to the Great Spirit”. 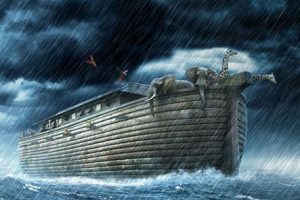 The biblical creation stories recounts that God was filled with sorrow over the corruptness of the people on the earth that He decided to wipe out the whole earth with a great flood, only saving the righteous man named Noah, a few family members and two of every animal (Genesis 6). Aside from the stories having a similar phenomenon of the flood, they differ in their overall chronologic structure. In the Pottawatomi Legend, the Great Spirit creates a new man and sister after the flood, while in the biblical creation story, the creation of Adam and Eve, a new man and woman (not sister), starts at the beginning of Genesis (Genesis 3) and the story of Noah and the flood follows it (Genesis 6). The Great Spirit differs from God in the sense that he completely remakes man after the flood, while in the biblical creation story, God continues the human race through Noah, a righteous man he spared. This indicates that the Pottawatomi are no longer connected to the “wicked dogs” and are therefore civilized. They stress values such as nothing is redeemable and a total revision needs to take place for a tribe to develop, whereas Christians believe humans were redeemable after the fall, and thus God continued the line through Noah. These comparison and contrasts between the Pottawatomi creation story and biblical creation story reveal the important Pottawatomi values and that Elmira, by staying true to her tribe values and origin, has not assimilated to the Christian ways of the Indian school. The Pottawatomi Legend reveals that the Pottawatomi are quite civilized due to their history of the creation story and they clearly value the crop, Maize. In addition, this tribe has features of a matriarchal tribe that differ from the creation story in the sense that it was started with a man and sister rather than a man and woman, as in the biblical creation story. Furthermore, the Pottawatomi creation story has a different chronological order compared to the biblical creation story, since the flood came before the creation of the man and sister. By including all these values and displaying also key differences between the two creation stories, Elmira is able to educate the readers on the culture and values of the Pottawatomi tribe. Moreover, “A Legend of the Pottawatomi” causes the Native American values to overshadow the American values taught at the school. By this very legend existing within The Indian Craftsman, the text itself does not just overshadow but even further, pushes against the oppressive values of the school and assimilation. Even though Elmira showed signs of assimilation since she had excellent character within the school, commendable reading and writing skills and worked at government school owned by the Bureau of Indian Affaires, she is actually a more complicated human being. Amidst all this, she still has pride in her culture, stayed true to her Native American heritage and values and refused to fully assimilate, particularly within her writing. She also not only puts emphasis on her own tribe but blurs the lines between the Chippewa and Pottawatomi tribes through writing the legend, displaying the importance of both tribes in her life. By including this very work in the canon, Elmira is able to truly educate her readers on the Pottawatomi tribe, thus preserving its culture. This entry was posted in Elmira Jerome, Tribal Educators and tagged Adam and Eve, Assimilation, Biblical Creation Story, Bureau of Indian Affaires, Ceremonies, Civilized, Corn, Creation Story, Cultural Preservation, Cultural Pride, Cultural Values, Emergence Origin Story, Equality, Feasts, Great Flood, Henry Pratt, Human Origins, Kitchemanito, Legend, Maize, Man, Matriarchal, Mondamin, Myth, Narratives, Nation, Noah, Origin Story, Pottawatomi, Prophecy, Savages, Sister, The Great Spirit, Tribe, Wicked Dogs. Bookmark the permalink.